Welcome to our Newly Designed Web Site! DJ Live Productions was created about 10 years ago by the owner Austin Beeghly! We service the greater Orlando area and surrounding cities and counties. Our compnay is about giving the customer what they want at a great price. All of our team members love what they do, and go the extra mile for all our customers! Whether it is a wedding, a birthday party, a Nascar race, or a pool party we do it ALL! Our music selection is very large, and getting the music you want is our goal! We want your event to be the very best it can be. 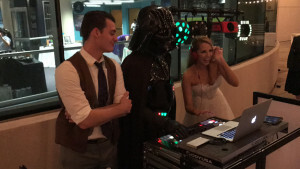 Our DJ's also serve as an MC making sure all of your guests know what is happening during your event. A great party needs someone to relate to the crowd, find out what they want and get people to get up, and dance! And all of us here at DJ Live Productions do that! We make every event we do more memorable, and have fun while doing it. There are so many DJ companies out there! We bring a very personalized expierence to you! You will always have a way to contact YOUR DJ either by e-mail or by phone! We have a personalized web site that is created for YOU and your event. When you sign up with us, your online account is created with a password you choose. With that, you set-up all your information from wedding party information, to the Birthday person's name and the all important, music selection. We have an on-line music selection process to make things easier on you. We also have timeline forms that allow your event to be scheduled down to the very minute! Another reason why to choose us. OUR PRICES! We offer the latest and greatest in DJ technology! From our lighting systems, to our crystal clear sound systems, our earth moving sub-woofers, and the best DJ's around! We guarentee you will have a great time at your event, and we will do everything we can to make it even better!